Single-Reheating or Double-Reheating, Which is Better for S-CO2 Coal Fired Power Generation System? The objective of this paper is to provide the optimal choice of single-reheating or double-reheating when considering residual flue gas heat in S-CO2 coal fired power system. The cascade utilization of flue gas energy includes three temperature levels, with high and low temperature ranges of flue gas heat extracted by S-CO2 cycle and air preheater, respectively. Two methods are proposed to absorb residual flue gas heat Qre in middle temperature range. Both methods shall decrease CO2 temperature entering the boiler T4 and increase secondary air temperature Tsec air, whose maximum value is deduced based on energy conservation in air preheater. The system is analyzed incorporating thermodynamics, boiler pressure drop and energy distribution. It is shown that at a given main vapor temperature T5, the main vapor pressure P5 can be adjusted to a value so that Qre is completely eliminated, which is called the main vapor pressure adjustment method. For this method, single-reheating is only available for higher main vapor temperatures. The power generation efficiency for single-reheating is obviously higher than double-reheating. If residual flue gas heat does exist, a flue gas heater FGC is integrated with S-CO2 cycle, which is called the FGC method. Both single-reheating and double-reheating share similar power generation efficiency, but single-reheating creates less residual flue gas heat. 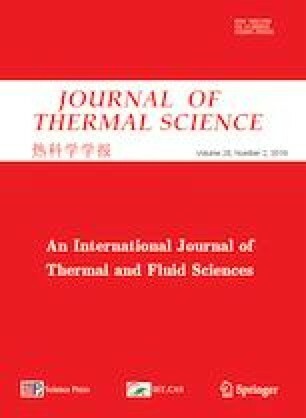 We conclude that single-reheating is preferable, and the pressure adjustment method achieves obviously higher power generation efficiency than the FGC method. This paper is supported by the National Key R&D Program of China (2017YFB0601801), the Science Fund for Creative Research Groups of the National Natural Science Foundation of China (51821004), the Fundamental Research Funds for the Central Universities (2018ZD02 and 2018QN042). BP statistical review of world energy June 2017. https://www.bp.com/en/global/corporate/energy-economics/statistical-review-of-world-energy.html, 2017.